A few years ago, when I was driving past an antique store in Laguna Beach, I saw an ornate Venetian mirror in the window. I visit Laguna Beach every year, and saw that same mirror in the window year after year; it would catch my eye each time. One year I decided to stop by and see the mirror in person. It was very, very expensive, amazingly ornate, and quite beautiful. On my most recent trip to Laguna Beach last summer, I noticed that the mirror was not in the window anymore. I am hoping that it sold to a wonderful person who is hanging it in a place of honor in their house. Recently, I have been noticing Venetian mirrors more than ever. My interest in Venetian mirrors is somewhat surprising to me, as the style is often ornate and I tend to like things a bit simpler (except for chandeliers!). Also, they tend to be more ‘glam’ in style than what I usually gravitate towards. But for some reason, Venetian mirrors have really been catching my eye lately. According to a source on Yahoo, “Venetian mirrors are made up of long lines and sweeping arches [with] polished edges and mirrored borders. They're available in a variety of shapes, including rectangles, ovals and circles. Some even have delicate etching around the perimeter of the glass. The feminine rosettes that adorn each Venetian mirror are gracefully ornate”. The detail, artistry, and style in Venetian mirrors give them a distinct look, whether they are antiques or reproductions. Here are some of my favorite rooms with Venetian mirrors – which one is your favorite? This beautiful living room designed by Kendall Wilkinson has my favorite style of Venetian mirror, the octagon with an ornamental flourish on the top. This particular mirror is an antique that was found in Paris. 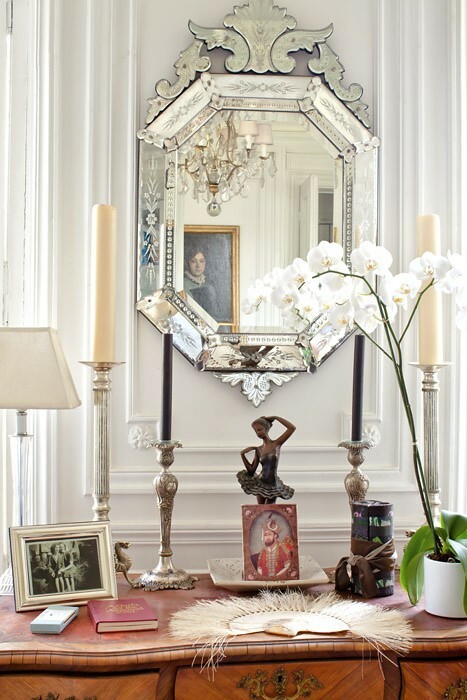 A Venetian mirror fits perfectly within the paneling on the wall of a Paris apartment. Note the beautiful flower detail etched on the glass, and the lovely reflection in the mirror. Found on Pinterest. This more clean lined Venetian mirror, with a band of black, looks perfectly at ease in this more streamlined décor by Kevin Carrigan (Elle Décor). 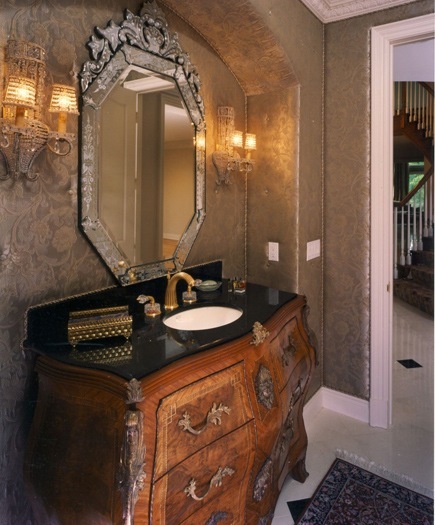 The detailed design of this Venetian mirror creates high drama in this small space. I spotted this Venetian mirror on katiedid. 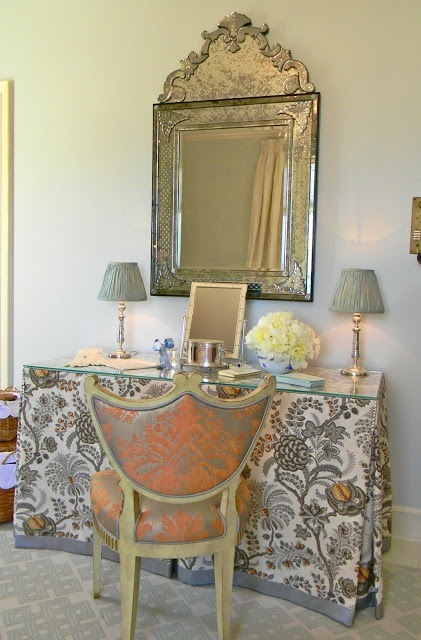 It’s in a room designed by Josephine Fisher for the 2011 San Francisco Decorator Showhouse. Another Venetian mirror seen on katiedid, from a local holiday home tour. 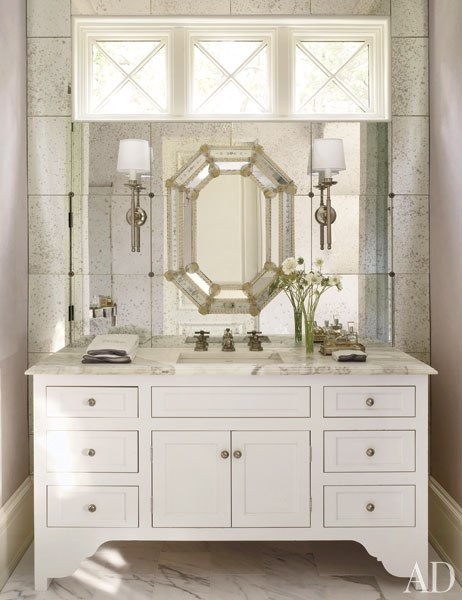 By placing a Venetian mirror in front of a window, a vanity area is created. 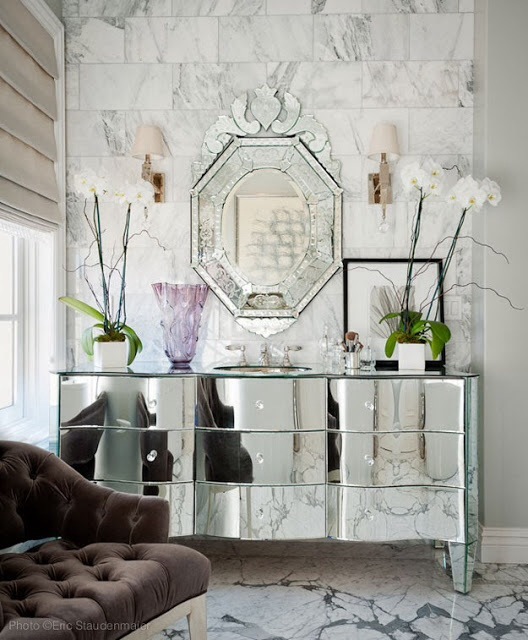 The soft curves and feminine style of the mirror is ideal in this space designed by Miles Redd. A beautiful mirror, although I wish the reflection were a bit more interesting! Maybe at eye level it is. Design by Eleanor Cummings. A small and delicately styled oval Venetian mirror is the perfect touch in this ethereal room. Source unknown. 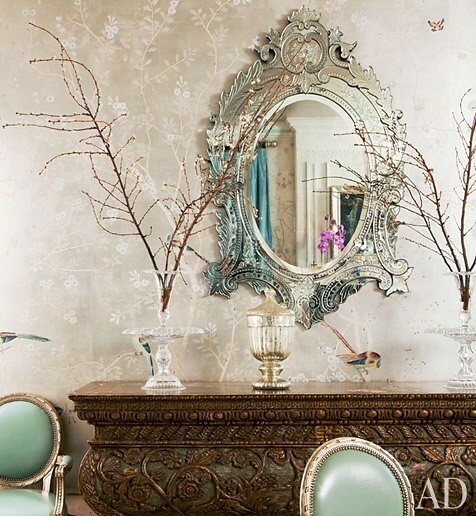 De Gournay handpainted wallpaper and a Venetian mirror seem like a natural fit – both are so graceful and feminine. This dining room was designed by Martyn Lawrence Bullard, as seen in Architectural Digest. Another example of a dining room with hand painted wallpaper (I think this might be Gracie) and a beautiful Venetian mirror. Design by Mark Sikes. I found this beautiful picture on the de Gournay website – handpainted wallpaper (this pattern is de Gournay’s ‘Askew’) and a Venetian mirror is an amazing combination. 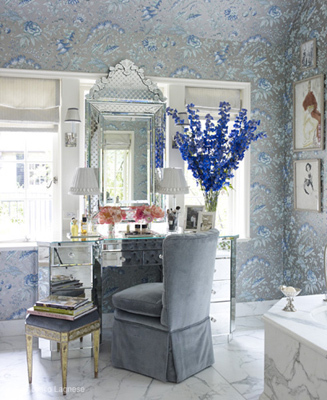 I wish I could find a full view of this room – it’s a shame the top of the mirror is cropped out! This might just be my new favorite dining room picture – I love everything about it, the color palette, the feminine style. Design by London based Alison Henry. Here is the London house of designer Alison Henry – note the matching Venetian mirrors above the fireplaces (one is antique, one an exact reproduction). 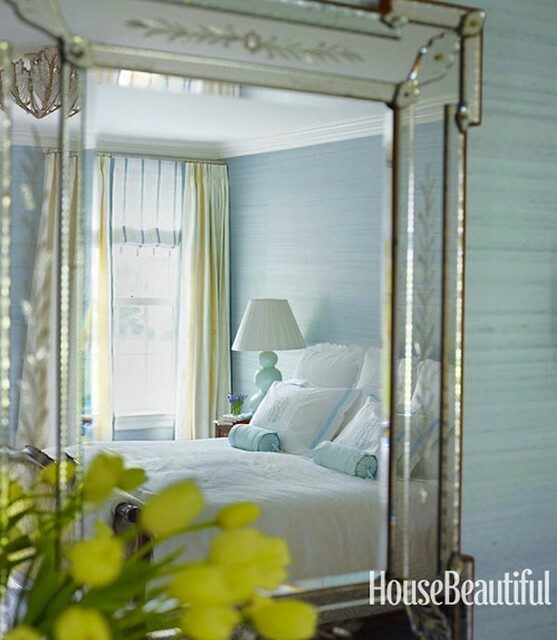 She also has two Venetian mirrors in her bedroom – clearly she loves the style. This was a WSJ house of the day in 2012, Image source. I have had this picture saved for a few months – it was possibly the inspiration for this post! Paloma from La Dolce Vita featured it as a room of the week in December. Design by On Madison. 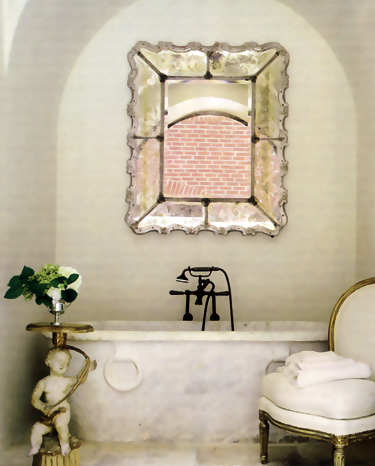 A bathroom designed by Suzanne Kasler Interiors features a beautiful Venetian mirror mounted on a wall with an antiqued mirror. A very clean-lined style Venetian mirror looks beautiful in this gray and purple room. 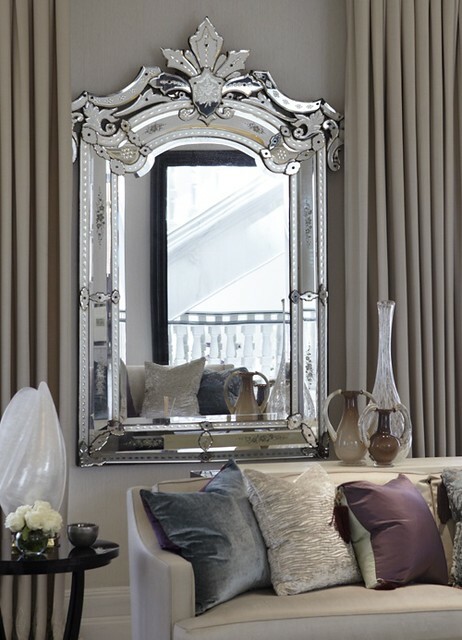 Another purple and gray room with a Venetian mirror – I am seeing a trend here! Image source. This is one of my favorite images found in January, and I didn’t really clue into the Venetian mirror until researching this post. 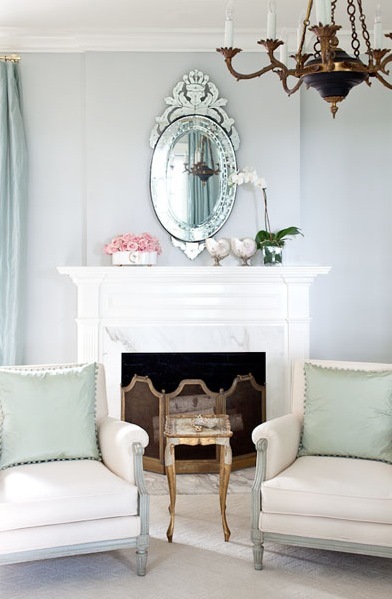 The soft and feminine of the style works beautifully in this room. A bold dining room has it all, including a statement making Venetian mirror. Image source. I like this image because it shows the versatility of a Venetian mirror (albeit a simpler design) in more streamlined décor. 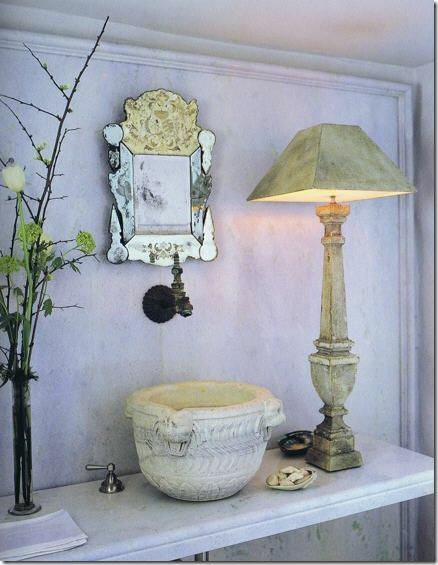 One of my all time favorite vignettes, designed by John Saladino – and it has a charming small Venetian mirror. 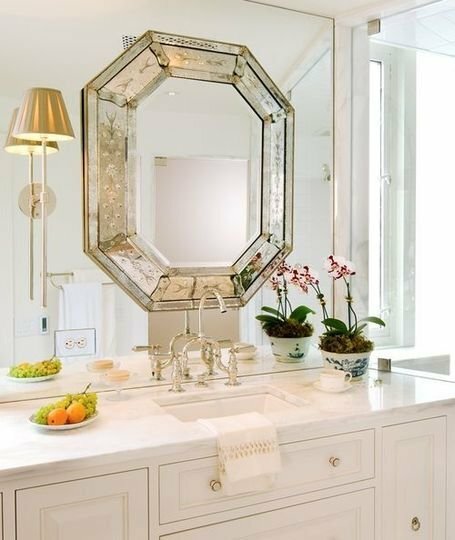 This much blogged about bathroom, designed by Tricia Huntley, deserves a spot in the Venetian mirror hall of fame – it’s a beautiful mirror made even more interesting by hanging it on top of a mirrored wall. Another image from the Venetian mirror hall of fame, I couldn’t resist using it in this post – this space is so beautifully designed, and the mirror is the perfect touch. Attributed to the Gerald Pomeroy Design Group. As a contrast, a more richly colored space utilizes a Venetian mirror to great effect. 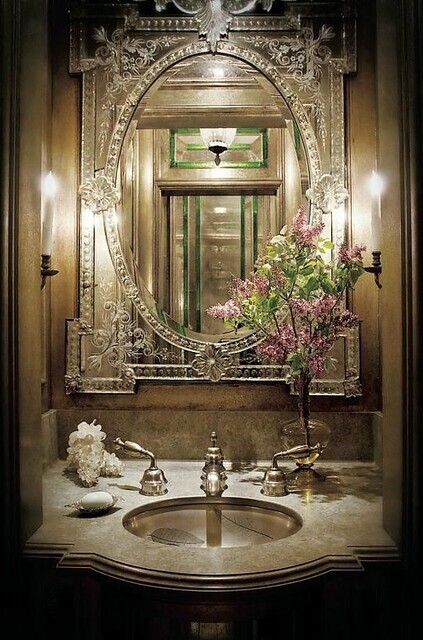 I always read that the powder room is a place where designers can use a lot of drama to great effect, and Venetian mirrors seem to be a favored way of doing this. Found on Pinterest. I love the way this photo was framed up – the room is seen in the reflection of a beautiful Venetian mirror. Design by Ashley Whittaker, via House Beautiful. 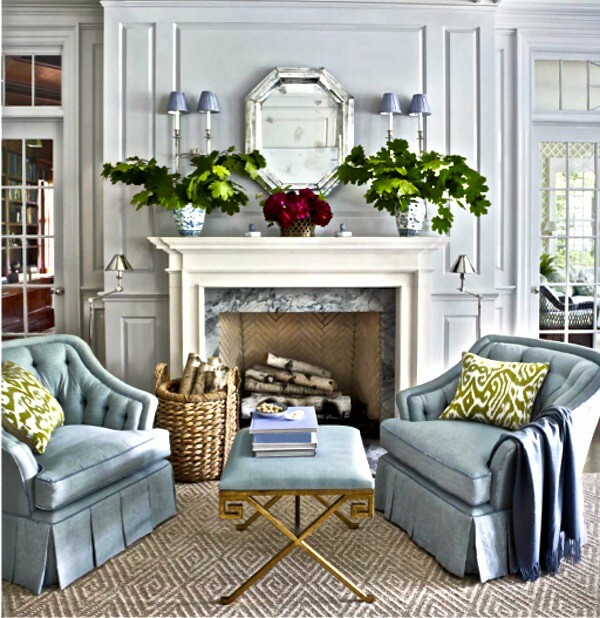 The living room of the same apartment by Ashley Whittaker, via House Beautiful. This space is beautiful for so many reasons – the architecture is lovely, and the chandelier looks right up my alley. However, it is the Venetian mirror that is a standout of the space, with its tall lines and ornate style. 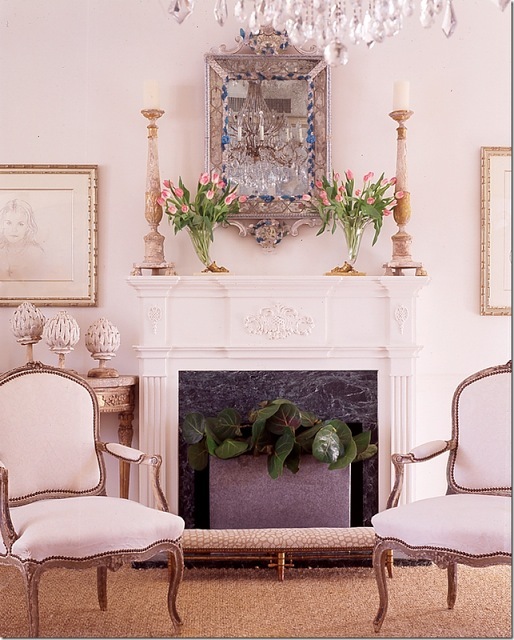 This is one of my favorite rooms by New Orleans designer Gerrie Bremermann. There is a matching mirror on the other side of the window. Although this is not an ornately styled Venetian mirror, I would categorize it as Venetian in style due to the style, the rosettes, and the mirrored frame. Photo credit Tria Giovan. Here is a view of both mirrors. I love both the mirrors and the Italian consoles underneath – so beautiful. 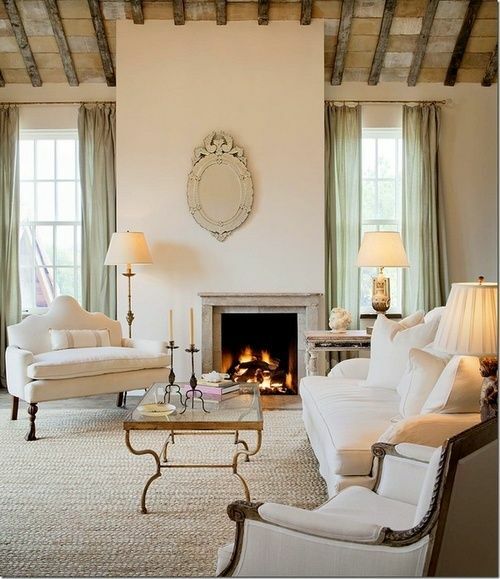 Image via Cote de Texas, from the book Southern Living Style: Easy Updates*Room by Room Guide*Inspired Design Ideas. Click here to see on Amazon. 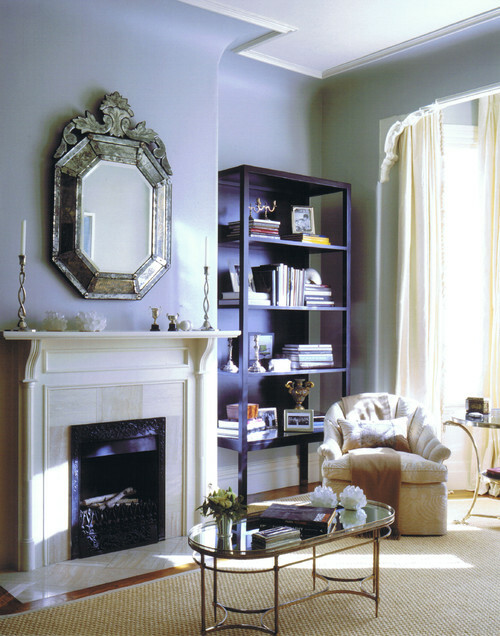 In the same room, on the other side, is a beautiful vignette – a more classic style Venetian mirror with blue accents. So, what do you think of Venetian mirrors? I think this post shows that they can go in just about any room, and blend with many styles of décor. Do you have a favorite picture? I would have to say this one below is my favorite – the dining room in Mayfair (London) – I wish I could see the whole room (and the whole mirror)! I enjoyed this post! Thank you for the great selection of settings for these beautiful mirrors. This post is making me want a Venetian glass mirror even more! I am not sure where I would hang it, but I can see that there are so many options. I like it best in a formal dining room. The style adds a lot of bling. For me these mirrors work in just about any setting. Lovely! Oh that John Saladino bathroom!! Wow, I will always love Venetian mirrors! You have done your research - I have seen a lot of posts on Venetian mirrors, but have never seen most of these. I appreciate the time and also the commentary on the pictures. Splendid post. So many beautiful choices. 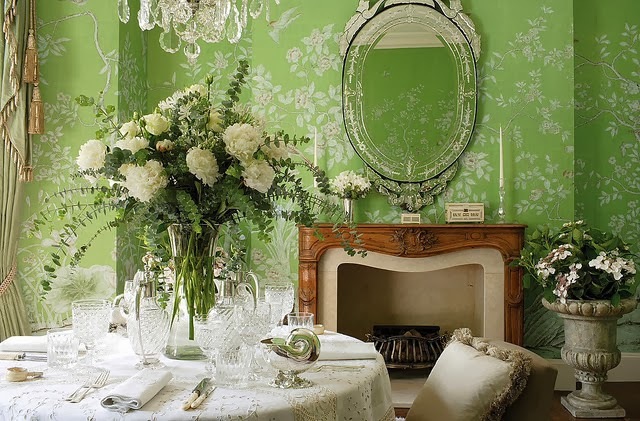 I especially love the de Gournay 'Askew' - round style with a top and bottom crown. 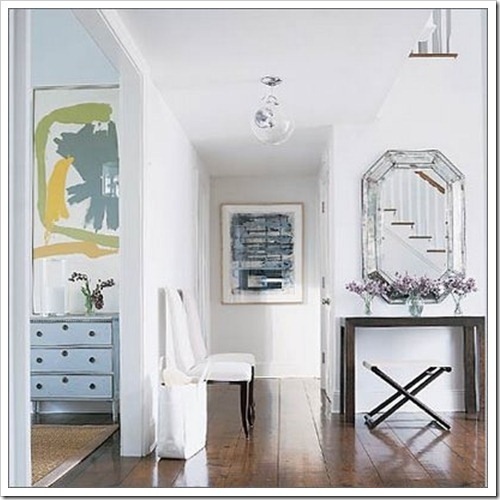 Venetian glass mirrors look wonderful in both traditional or contemporary settings, and as John Saladino proves they work in rustic/patina settings. Yes a mirror on a mirror, bravo. I'm also looking for a mirror on a window a la McAlpine. What a joy to see all of these photographs! Each mirror is just beautiful and remarkable, love them all! What a gorgeous collection of images. 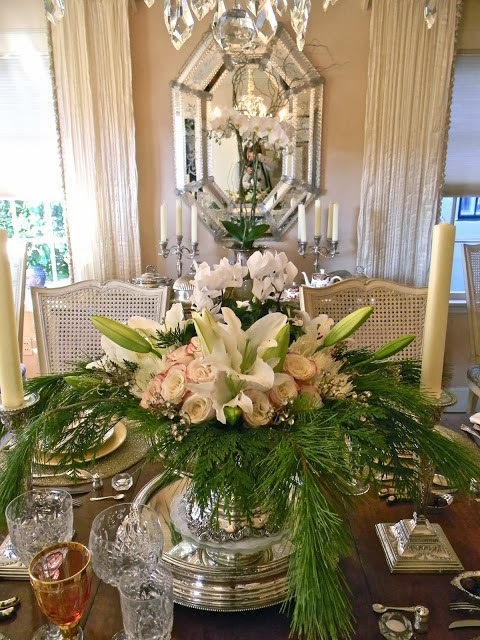 These mirrors are so so classically beautiful they add elegance to formal rooms of every style. As such your blog name, your blog is really inspiring one. I just love the way you are expressing. I am going gaga over the purple interior painting! Beautiful! I recently found a very lovely "Venetian" style mirror at my local antique / junque store. It was only $35. While probably new, it still had a lot of style. Should have snapped it up. When I went back a few days later, it was gone. Another, smarter person obviously saw the potential. Lesson learned! Gorgeous post. I regret selling a beautiful one I had that i thought I would not use anymore...boy I could have found 10 places for it!! They are spectacular and you chose so many gorgeous examples. Just back and trying to catch up a bit....and figure things out with the new blog..CRAZY!!!! I know in the end it will all work out, but theres still much work to be done!